Pat dry the meat and brush it with one tablespoon of dark soy sauce and one tablespoon of Chinese rice wine, then deep-fry it until golden brown. Plunge the meat into cold water for between 20 and 30 minutes. Slice the meat thickly. Heat a few tablespoons of oil in a wok and stir-fry the chopped garlic, shallots and sliced meat. In a dry wok, fry the mui choy until it is dry. Add the mui choy to the meat. 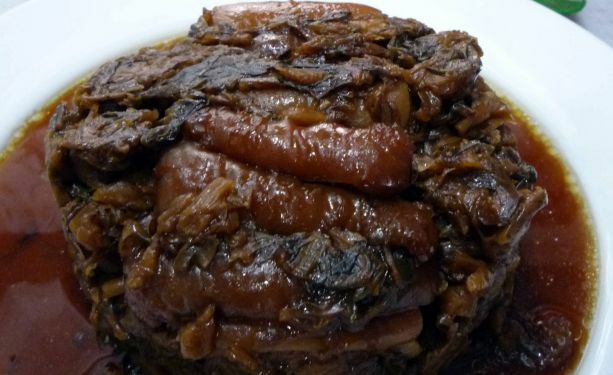 Season with two tablespoons of sugar, three tablespoons of Chinese rice wine, one tablespoon of oyster sauce, one tablespoon of light soy sauce (sheng chou) and two tablespoons of dark soy sauce (shai you). Place the meat and mui choy into a bowl and steam for two hours. To serve, invert the bowl onto a serving plate.